In New York City, especially in the outer boroughs, landlords often fail to salt or shovel the snow off their sidewalk after a snow fall. As a result, frequent traffic and daytime warmth pack the snow into dangerous ice. Legally the onus to clear the sidewalk is on the landlord, but really, shouldn’t the pedestrians who use the sidewalk be responsible for it? Maybe there’s a distributed, casual way to solve this problem. A lot of kinetic energy goes into compressing the snow under each step that could instead be harnessed to move or melt it. Here are a few sketches. They all have flaws, but perhaps they can inspire better ideas. The design requirements were that the solution be casual (nobody wants to spend more energy on their morning commute), comfortable, affordable (rich people don’t walk), and sustainable. These sketches were inspired by the Johnny Apple Sandal, a sandal with “phytoremediating” plant seeds built into the sole, which are slowly deposited as the sandal wears away. 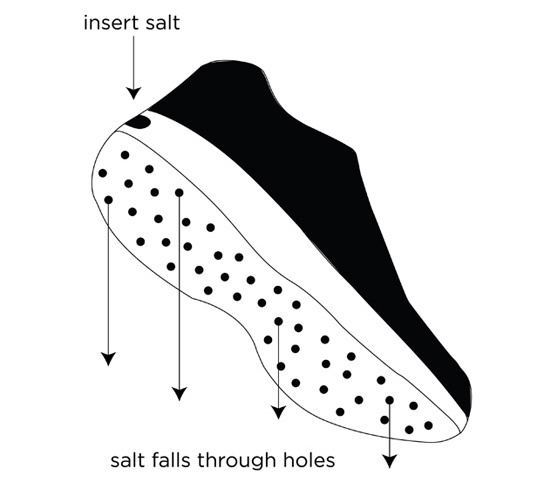 A shoe with a hollow sole for storing deicing salt, and holes on the bottom for gradual distribution. Can it be structurally sound? How difficult would it be to refill the salt? Would people be willing to spend money on their own salt? Salt purchase and distribution seems like the biggest issue with this design, which is not a technological problem at all and could be solved municipally. Imagine bins of salt on each street corner free for public use, whether for a landlord's sidewalk or for your own salt distribution device.